JTA — At 3 1/2, Peretz Apfelbaum may not completely understand it yet, but some kitchens can put his life in danger. The Brooklyn boy is allergic to peanuts, cashews, pistachios, flax seeds, mustard seeds, coconut, peas, eggs and beef. Some of the foods give him hives, but the nuts can send Peretz into anaphylactic shock. The inherent risks make it impossible to test the severity of some of the allergies, meaning he could have other, unexpected reactions to some of those foods. Obviously it is an extremely distressing situation for his mom, Chanie. But the 36-year-old mother of five from Crown Heights is doing something other than worrying. 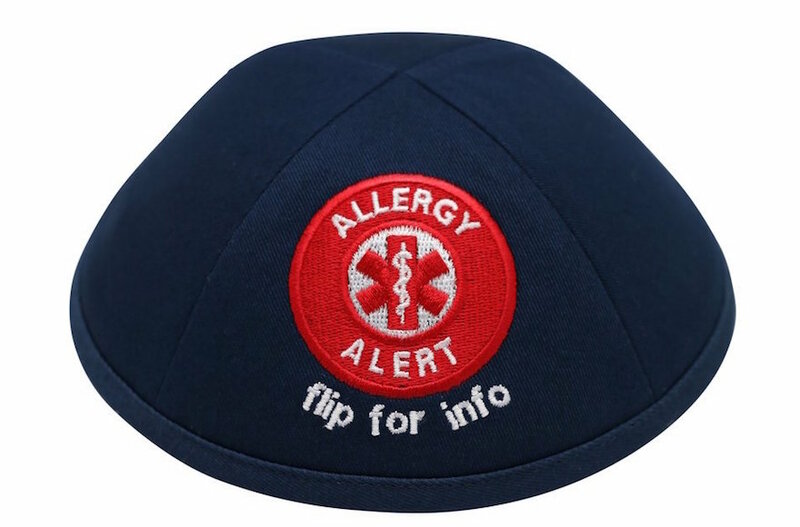 Chanie Apfelbaum came up with a simple, clever idea to notify others that her son has severe allergies: an “allergy alert” kippah. 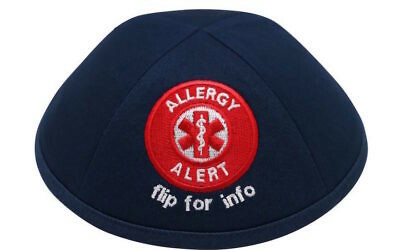 The skullcap, which Apfelbaum helped design with the Brooklyn-based company iKippah — an online retailer with bright designs like the one inspired by “The Very Hungry Caterpillar” — is navy blue with a red circle on the front that contains the words “Allergy Alert.” It also says “flip for info” — the underside has lines to write down the child’s allergies. The company put the allergy alert skullcap on its website two weeks ago and, according to Seewald, has already sold a few hundred. Though the skullcaps are still unavailable in stores — iKippah has about 180 retailers as customers, in addition to its direct-to-consumer website — the company plans to make them available for wholesale soon based on the unexpected demand. Food allergies have increased markedly in the United States in recent years. Research by the US Centers for Disease Control has shown that food allergies in children rose by 50 percent between 1997 and 2011, possibly from overuse of antibiotics or increased hygiene, which shields children from being exposed to infectious agents during the critical immune system-forming years. Apfelbaum — a popular kosher food blogger under the moniker Busy in Brooklyn with more than 33,000 Instagram followers — has borne witness to the trend. She said Peretz used to wear a bracelet noting his severe allergies, but she feared it wasn’t prominent enough for others to see. 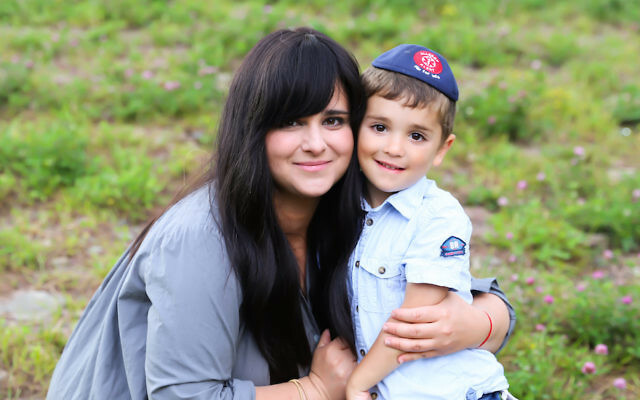 The kippah is an easy way to inform anyone serving food to an allergic child — at camp or restaurants or a parent hosting a play date — that they should be careful. Plus Peretz, who is a member of an Orthodox household, already wears a yarmulke every day. Apfelbaum, a member of the Hasidic Chabad-Lubavitch movement, was worried, too, about Peretz running around from house to house in her community’s summer bungalow colony in upstate New York. She started a WhatsApp group to message other parents about her concerns, and she helped make the colony nut free. But the worries never totally disappear for the parent of a child with severe allergies, especially when he or she is very young. “I always remind him, but I can’t trust a 3-year-old to remember that he always has to ask before [he eats something] and say ‘I’m allergic,’” Apfelbaum said. Still, it took Apfelbaum a little time to become accustomed to her son wearing the same kippah every day — she would help Peretz pick out a skullcap that coordinated with his clothes.